The countdown to Thanksgiving begins! 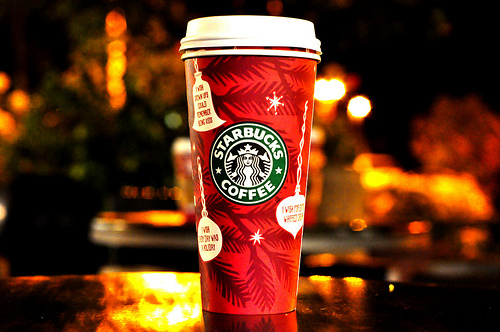 Starbucks holiday cups are here!!! Living in Southern California, sometimes it’s difficult to know what season it is, seeing as how that darn sun shines ALL THE TIME! (I am from the East Coast and enjoy seasons.) We get a little temperature change here and there is a rainy-ish season, but when you step outside, winter and summer don’t differ quite as much as they do on the other side of the US. So, I use Starbucks coffee cups to tell me what time of year it is! In the spring and summer, you typically see the clear, iced versions and in fall and winter, the paper cups are more prominent. So, when November arrives and I see people holding those exclusive red cups, I immediately feel the holiday spirit bubbling up in my tummy, then upward toward my chest, then neck until it spills out onto my face in the form of a huge smile. Thank you Starbucks! I look forward to this every year!!! OMG OBSESSED! *Starbucks gift cards make GREAT gifts! And, this time of year, they come in cute little packaging like a mini stocking or felt envelope. LOVES IT!